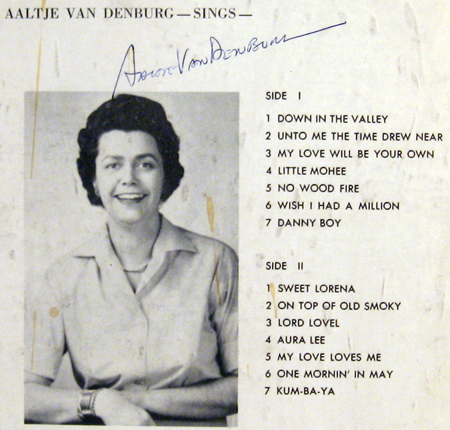 Of what little info there is to be found of her, Ms. Van Denburg was born in 1919 to parents of Dutch ancestry. 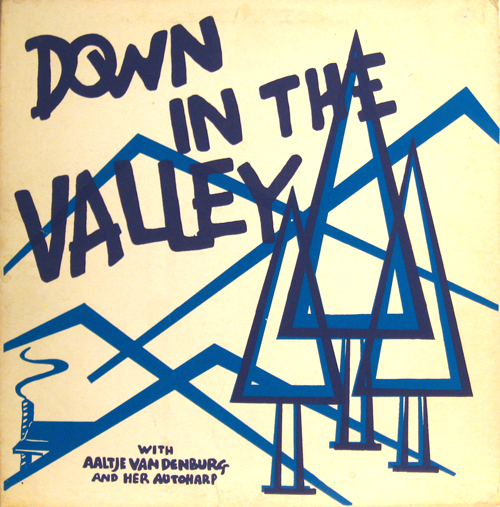 Proficient and professional in the arena of arts and crafts, home economics, and interior design – as a folk musician Aaltje had “a wide group of admiring listeners and friends,” according to the liner notes on this album anyway. How far and wide her fame actually spread is speculative. Nonetheless, it is obvious she was a brilliant folk musician, and likely that her reputation didn’t quite spread as far as her talent warranted. She released at least three albums, Down in the Valley being preceded by Folk Songs for Children, and Somebody’s Tall and Handsome. Included here is one of her original compositions, as well as possibly the most beautiful rendition of On Top of Old Smoky one can find. Many consider this to be her best work to date, as she has combined her soft throaty voice with [...] an unusual collection of lonesome and sentimental ballads of the spirit that expresses a yearning for loved ones far away. A lovely contralto voice that blends well with her auto harp accompaniment is certain to thrill YOU – the lucky listener! I played “On top of old smokey” for my aunt Katie who apparently sings the song frequently while cooking (according to her grandchildren)… she enjoyed it. This was my aunt. I remember her singing these. She lost her fiancé in we 2. She always had his picture on the night stand.